Today is Wednesday, December 7, the 342nd day of 2016, with 24 days remaining. There are 14 days until the winter solstice, 16 days until Festivus, 17 days until the start of Hanukkah, 18 days until Christmas Day, 44 days until Donald Trump becomes president of the United States, and 699 days until the November, 2018 mid-term election. NASA's "Blue Marble" image of Earth. On this date in 1972, Apollo 17, the final mission of NASA's Apollo program, was launched from Kennedy Space Center Launch Complex 39A at 12:33 am, the first night launch of a U.S. human spaceflight and the final manned launch of a Saturn V rocket. Apollo 17 is the most recent manned Moon landing and was the last time humans travelled beyond low Earth orbit. The mission broke several records: the longest moon landing, longest total extravehicular activities (moonwalks), largest lunar sample, and longest time in lunar orbit. 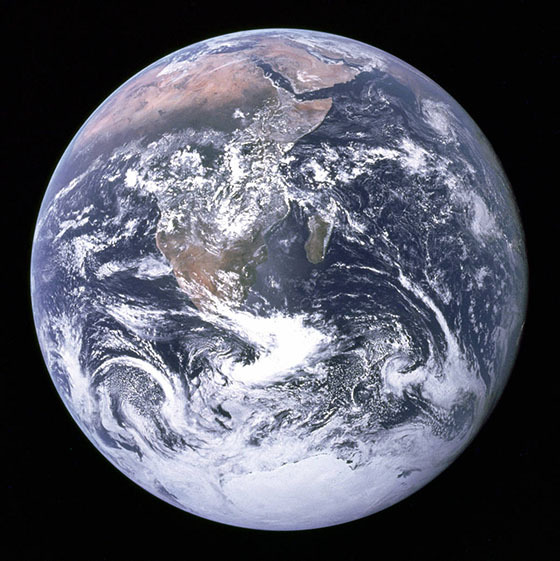 Apollo 17 is perhaps best known as the flight on which The Blue Marble photograph was captured. Taken on December 7, 1972 at a distance of about 45,000 kilometers (28,000 miles), it is one of the most reproduced images in human history. lifts off from the surface of the moon. Among other things, today is also National Cotton Candy Day. A form of spun sugar, the confection is made by heating and liquefying sugar and spinning it out through minute holes, where it re-solidifies in minutely thin strands of 'sugar glass.' The final cotton candy contains mostly air, with a typical serving weighing approximately one ounce. Ironically, of the three men generally credited with developing the modern cotton candy machine, two were dentists. And, of course, today is Pearl Harbor Day. At the time of the Pearl Harbor attack, there were 96 ships anchored. During the attack, 18 were sunk or seriously damaged, including eight battleships. There were 2,402 American men killed and 1,280 injured. Three hundred and fifty aircraft were destroyed or damaged. Florida man breaks into woman's home to pet family cat. As of this writing, The KGB Quotations Database contains 42,586 entries. Check it out. Quote of the day: "But you can travel on ten thousand miles, and still stay where you are." -Harry Chapin (lyrics, WOLD). If you think 2016's been bad, then you should probably skip Bloomberg's Pessimist’s Guide to 2017. Using computer simulations so comprehensive they took a year to run, researchers found that by 2100 many places around the U.S.’s Gulf and Southwest could see up to a 400 percent increase in the number of ultra-drenching summer storms. Mexico is also facing a big uptick in extreme rains, and the risk is jacked up on Atlantic Coast and around the Rockies. Summer storms will probably deliver heavier rain-bombs over most of the country, the researchers believe, but especially in the Southwest and the Northeast where rain intensity could swell by 70 percent. 'Tis the season for giving, so here are all the body parts you can donate to a good cause. The biggest boon to lexical research in the past decade has been newspaper databases. Among the revelations: Slang is a lot older than previously thought. This week marks the 25th anniversary of the release of Star Trek VI: The Undiscovered Country, the last of the films exclusively featuring the cast from the original series. Director Nicholas Meyer discusses the film, which he calls the franchise's "grittiest and most realistic." An excellent Rachel Maddow piece: conflicts of interest within the Donald Trump administration, and on Bob Dole's lobbying firm taking credit for arranging the call between Donald Trump and the president of Taiwan.